My buddy Raif's new company, Carsala, has come out of stealth mode. Carsala is a fantastic way to buy a used car because it pulls together used cars for sale from a bunch of different data sources, so it has the most complete and up to date available inventory. Once you figure out what you are looking for, the screen shot below, you engage Carsala and their agents go out and negotiate a great deal for you. The coolest thing is they save you a ton of money, somewhere between 20% to 30% off the blue book price. 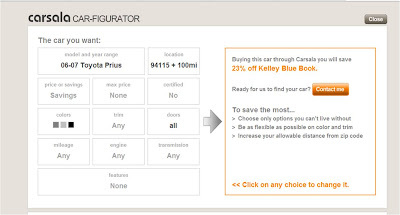 You can see below the projected discount on a Black 2007 Prius is 23%, and its the exact car you want. Pretty cool stuff.